Organic social media is often considered a trusted medium — a transparent brand-communication vehicle to earned followers plus an opportunity for peer-to-peer recommendations (and thus, brands hope, word-of-mouth marketing). But what about brands that buy their way into these conversations? This week, we take a look at how much different age groups trust social ads. Read on to see the data, along with analysis and commentary from MarketingSherpa and Shelby Andrews, Director at North 6th Agency. The below chart takes a deeper dive into the Ads embedded in social media (Facebook, Instagram, etc.) category to see how the response varied among different age groups. To see 35 more charts from the study, download the free report. As you might expect, millennials were most trusting of social media advertising when making a purchase decision and were the only age group in which a majority (54%) said they trusted social media ads. Generation X, at 46%, was also more trusting than the national average (43%). When compared to other channels, social media ads were in the middle of the pack — tied with sponsored posts for eight most trusted channels when consumers were making a purchase decision. Four channels were less trusted than social media ads: online banner ads, mobile phone ads, ads in podcasts and online pop-ups. 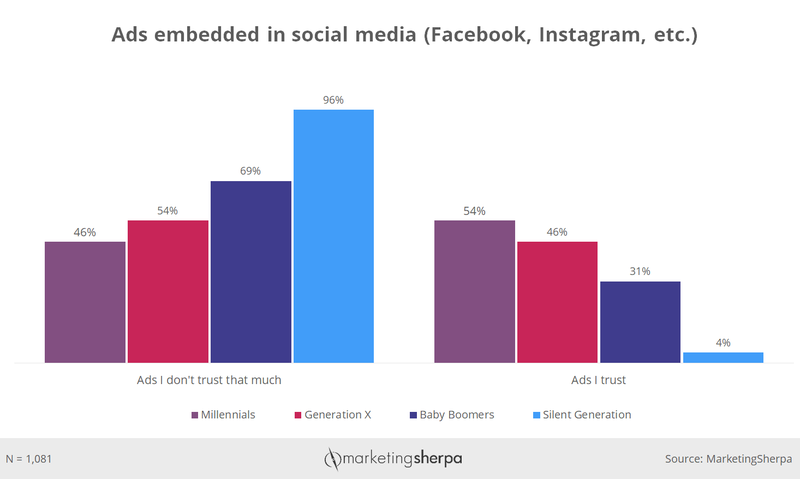 However, for the Silent Generation, social media ads were the least trustworthy of any channel, with only 4% of that group saying they trust ads embedded in social media when they want to make a purchase decision. If you do engage in social media advertising, to be successful you have to take into account many other factors in addition to the overall demographic. For example, as you see in the chart above, even among millennials, many are skeptical of social media ads. And on the flip side, about a third of baby boomers do trust the ads. While that is a minority of the overall generation, it is still a sizable target market. Of course, even the customers who do appreciate them don’t respond to every single ad they see. So here are a few tips to help you get the best return on those ads. Keep in mind what is being displayed alongside the ads you are buying. And consider running different ads than you would in other media. “Social media is more of a two-way dialogue between marketers and consumers than it has been with more traditional media (such as newspaper, TV, etc. ), and therefore, social media advertisements should be created as such. Rather than trying to directly sell a product or service, social media should be used to start a conversation or ask a question that grabs the attention of potential consumers,” said Shelby Andrews, Director at North 6th Agency (N6A). Customers inherently understand the importance of the relationship aspect in marketing as well. In addition to the quantitative data, we also asked customers a general open-ended question about what advice they would give to marketers. “To relate to the customers more than just trying to sell their product,” one customer responded. And social media gives the brand an opportunity to do just that. In addition, if you are able to make that connection, social media advertising has a benefit over most other forms of advertising. It provides a “multiplier effect” over and above the direct exposure of your ad if it is compelling enough to encourage consumers to like, share or follow the ad and your brand accounts. “While consumers are generally more suspicious of ads, they tend to be very trusting of recommendations from their peers, and social media offers a great opportunity for this. If someone sees their friend ‘liking’ or recommending a product or service on social media, they're much more likely to trust that product or service than if the brand itself was behind the ad. That's why more and more brands are incorporating social media influencers into their campaigns,” Andrews said. Which brings up another type of social media advertising. In addition to the display ads that platforms sell, brands can partner with influencers (i.e., social media celebrities) to promote their products as well. Just make sure you clearly and honestly communicate this sponsorship to ensure your brand and the influencer are complying with all Federal Trade Communication guidelines. Many social media platforms offer deep targeting capabilities for their ads and the ability to run “look alike” campaigns to find other customers with attributes similar to your existing customers and followers. Once you have identified the right niches (and micro-niches) to focus on, consider using messaging that ties into those attributes to create a relevant and compelling connection with this new audience. Again, this is an opportunity for more than just a conversion and product sale, it’s also a chance to build your earned audience who then becomes an asset for future organic social media campaigns. While the value of that audience varies by platform (and how much of your audience that platform’s algorithms allow your audience to see), the increased follower number will help build social proof for your brand. One customer simply advised “more information in social media but in a different way.” I’m not sure exactly what “different way” the customer was referring to, but really, that’s kind of the point. Regardless of how established social media has become — Facebook reportedly reaches almost a third of the world’s population every month — it is still constantly changing and evolving. New social media platforms are popping up all the time. And even if you don’t join them, established social media platforms often incorporate revolutionary new features from their newer (hipper?) challengers. So have a little fun. Experiment with some new ideas. And find a different way to connect with your potential customers.